Behind the French Menu: Cassoles, Cassolettes, and Cassoulets. Along with Four of the Most Famous Cassoulets on French Menus. Cassoles, Cassolettes, and Cassoulets. Along with Four of the Most Famous Cassoulets on French Menus. Cassoulets are substantial and filling heavy winter stews; virtually all of them originated in the historical province of Languedoc. (The historical province of Languedoc is within the boundaries of the new super region of Occitanie which includes the regions of Languedoc-Roussillon and Midi-Pyrénées. Occitanie was created on 1-1-2015 when France reduced the number of mainland regions from 22 to 13). A cassole is the dish in which a cassoulet is made; this cooking utensil gave its name to the dish called cassoulet. A cassole should not be confused with another cooking utensil that sounds very similar, the cassolette. A cassolette is small cooking bowl, not used for cassoulets, despite its similar sounding and similarly spelled name. (How confusing and annoying!). But watch out as French menus often include the name of the bowl or pan used in the preparation of a dish. A cassolette on your menu refers to a dish used for cooking and sometimes serving, but it does not refer to the ingredients. Cassolette de Moules – Mussels cooked and served in a cassolette. Cassolette de Champignons au Beurre d’Ail- Mushrooms cooked in garlic butter in a cassolette and served in it. The four "cassoulets" in this post are differentiated by their ingredients; though they all have a common thread in their preparation. All cassoulets are cooked in an oven very slowly. When ready cassoulets are at their best when lightly refrigerated for two or three days after cooking to allow all the flavors to come through; then reheated before serving. There are tens, if not hundreds, of different recipes for cassoulets in the towns and villages of Southern France. The cassoulets in this post come from the towns of Carcassonne and Castelnaudary in the department of Aude in Occitanie, Toulouse in the department of Haute-Garonne in the Midi-Pyrénées and Périgueux in the department of Dordogne in Aquitaine. 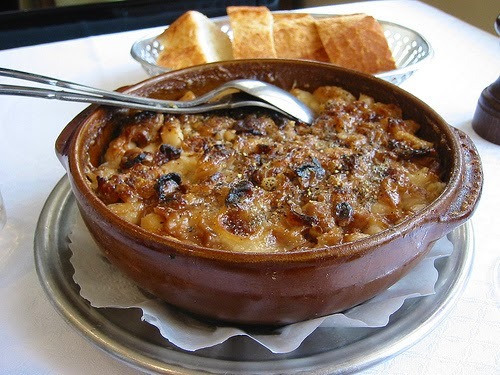 The cassoulet of Périgueux is the only famous cassoulet that comes from outside the old province of Languedoc. The Carcassonne Cassoulet has the most expensive ingredients of the famous four and includes the perdrix rouge, the red partridge, in its recipe. That makes it a very different cassoulet to the others. This cassoulet would rarely if ever, have been on an average worker or peasant’s table. Today wild partridges are protected, with a very short hunting season and the partridge in your cassoulet will have been farm-raised. Today, France farm raises many animals that elsewhere are considered wild game; including partridges, quail, pheasants, rabbits, hares, wild boar, deer and more. The Cassoulet de Carcassonne in addition to the red partridge includes pork loin, pork belly, bacon, pork rinds, tomatoes and carrots and, of course, France’s ubiquitous white beans. Photograph courtesy of Jonathan Caves. Carcassonne’s history began with the Visigoths followed by the Romans who were the first to start creating the defenses that today make this town a UNESCO World Heritage site. 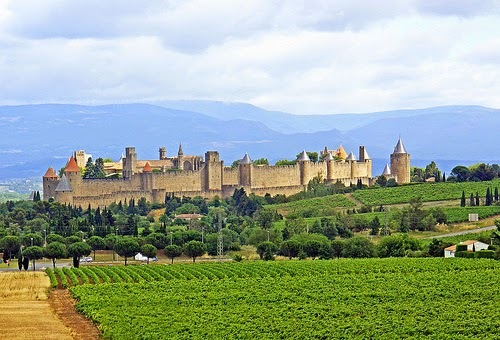 Today Carcassonne’s main industry is catering to the 3,000,000 tourists who visit every year and the vast wine-growing region of which it is the center. When visiting you may also rent a boat, with bedrooms, toilets, showers and a kitchen on the Canal du Midi,, also knows as the Canal du Deux Mers, the canal of the two seas. The Canal du Midi, which opened in 1681, allowed the whole region to export goods to the North of France via reshipment on large ships from Bordeaux on the Atlantic. For the north of France, the most important product was wheat, followed by wine, Armagnac, and timber. The canal saved a four-week voyage around Spain which included occasional pirate attacks from North Africa. Today with trains, planes, and fast roads the canal is only used for pleasure boating. If you do hire a boat, instruction included, you may cruise to Bordeaux on the Atlantic or down to the Mediterranean at the beautiful fishing port of Sète. Then, if you wish you may continue on to the town of Beaucaire 23 km (14 miles) below Avignon. By car or train, Carcassonne is just one and a quarter hours, 136 km (85 miles) to the fishing port of Sete on the Mediterranean coast. Sete, is famous for its fish and seafood cuisine and definitely worth visiting. Prosper Montagné, the chef, (1865 –1948), who, as much as Escoffier, brought French cuisine into the 20th century was born in Carcassonne. The legendary Castelnaudary Cassoulet is made with haricots blanc, the white beans, lamb, bacon fat, pork ribs, pork rinds, goose fat. With the most important ingredients being Toulouse sausages, garlic sausages, and duck or goose confit. All of that comes along with any vegetables that the chef chooses. 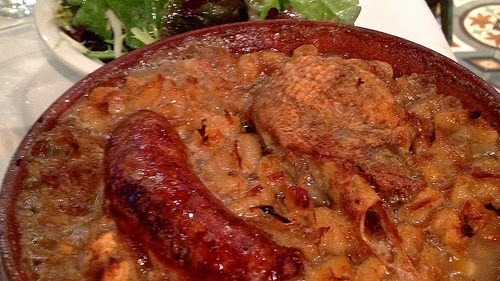 The proportions of each of the ingredients noted above are the key to the best Cassoulet de Castelnaudary, and each chef will keep his or her version a secret. 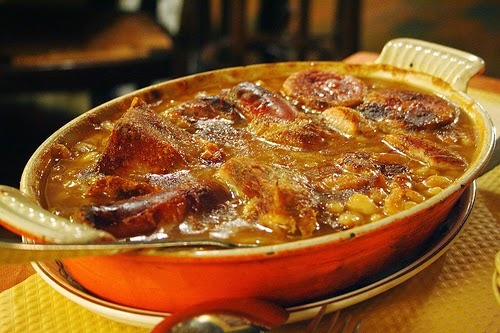 For the traditional recipe see the web site of the Confrerie of the Cassoulet de Castelnaudary. 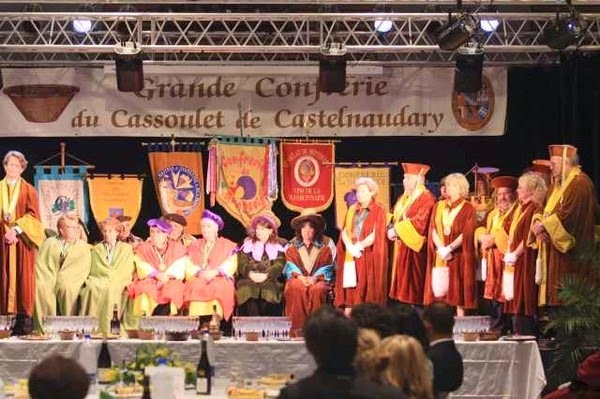 Confreries are brother and sisterhoods who organize to promote and defend their chosen fruit, recipe, wine or other edible products.If you really love this cassoulet you may join and wear the robes of a member of the Grande Confrerie. The Grand Confrerie of the Cassoulet of Castelnaudary. Lovers of good food do not visit Castelnaudary for their cassoulet alone. Castelnaudary is the center of a large farming community and home to many good restaurants in and around the town. Of course, apart from the wide range of dishes available, there are many distinctive wines. Castelnaudary was also once an important port on the Canal du Midi. Today, as in Carcassonne, you may take an organized boat ride on the canal or rent your own. Castelnaudary is close to many vineyards, some with very distinctive wines rarely seen at home, such as the Malepere AOC/AOP or the Cabardès AOC/AOP. Castelnaudary is very close to Carcassone, just 20 minutes by train and 30 minutes by car 42 km (26 miles). Castelnaudary is a smaller town than Carcassone, but it still keeps the visitors and the locals jumping. Castelnaudary has many fetes and fairs and of course, they have a Fête du Cassoulet. 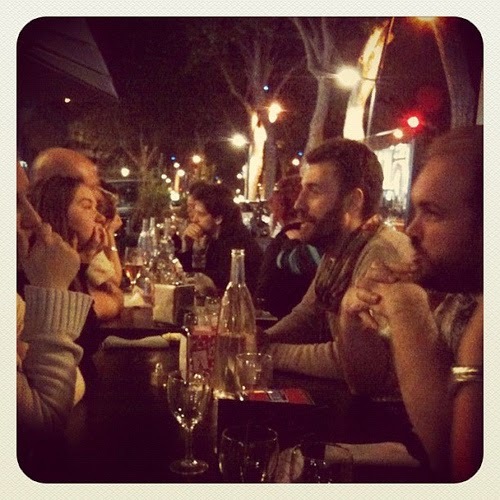 Their celebration of their cassoulet is held over the last weekend in August. If you are not in the area in August you may choose their Foire aux Fleurs, their flower fair in May. Also consider their Foire Gourmande, a gourmand’s fair in July. 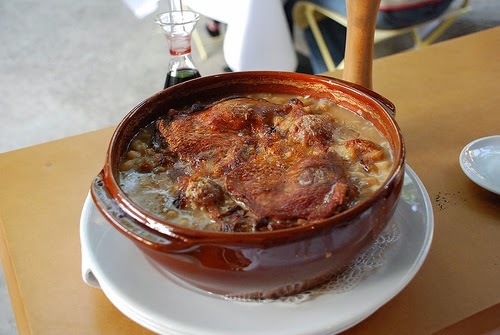 The Cassoulet Toulousain includes the Haricot Tarbais, the Label Rouge, red label, Tarbais dried white beans. The beans come along with pork loin, pork rind, goose and goose fat, duck confit and most importantly Toulouse sausages. Some of the recipes for this cassoulet include lamb. Photograph courtesy of David Mckelvey. Toulouse’s fame began under the Romans when the city was called Tolosa. Today Toulouse is the capital of the department of Haute-Garonne. Toulouse is on the River Garonne which is part of the Canal du Midi so you may also rent a self-drive boat. By car, Toulouse is 45 min and one hour by train, 64 km (45 miles) from Castelnaudary. 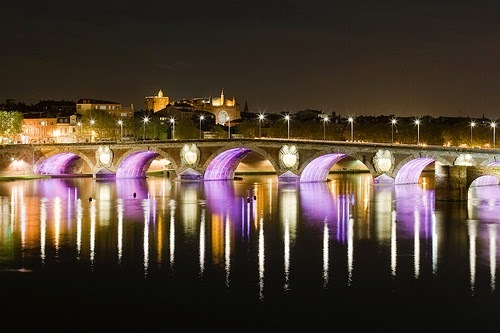 The Pont Neuf in Toulouse. Toulouse was also the site of the last, and unnecessary, battle of the Napoleonic wars. On the 10 April 1814, Marshal Soult and Wellington fought a bloody battle not knowing that Napoleon had already abdicated four days earlier. Despite fighting for Napoleon, Marshal Soult would go on to be a government Minister under the restored monarchy. Toulouse is the fourth largest city in France with a population of over half a million and home to Europe’s aeronautics industry. This is the most famous cassoulet in the department of Dordogne (Perigord) and the most highly rated cassoulet outside the old province of Languedoc. The recipe may vary a little from restaurant to restaurant. However, as much as they vary they will all include stuffed neck of goose or duck, flageolet white beans, duck confit and garlic sausage and tomatoes. Some may be made with added beef. 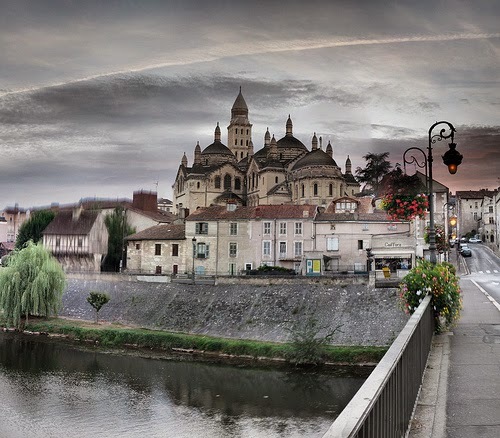 Périgueux is set on the River Isle, a tributary of the River Dordogne, and it is the capital of the Department of Dordogne in Aquitaine. 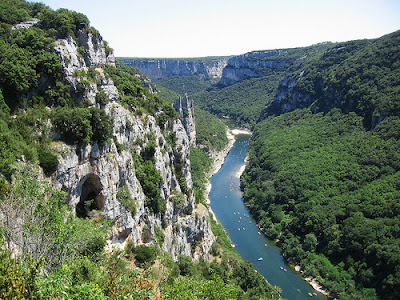 The Dordogne was mostly the old province of Perigourd and it is still called that by many of the locals. Périgueux has a walkable city center that has streets left from the middle ages. Périgueux is especially famous for its Ccuisine Périgourdine; it is one of the most important regional cuisines of France. Cuisine Périgourdine has dishes and products that will be seen on menus all over France: Sauce Périgueux, Salade Perigourdine, Duck confit, Perigord truffles, the Noix du Périgord AOP, the famous Perigord walnuts from the area and, of course, the Cassoulet Périgourdine. This snail dish above confuses many as it may be called a cassoulet or a cassolet. However, no matter how good this dish good tastes it is not prepared, in any way, like a traditional cassoulet. The name used depends on the chef and his or her knowledge of local culinary history and traditions. Enjoy this dish without reference to the spelling of the name. You will find this snail dish on the menu in many parts of France. For this dish, the snails either whole or chopped up will be fried in butter and then mixed with a sauce made with white wine. The flavoring will be garlic, parsley, shallots and chopped leeks all served with garlic flavored toast. Practically every region from the north to the south of France will have restaurants that offer their own versions. Whether a restaurant has a cassoulet or cassolets d'Escargots on their menu there, will be no hours of slow cooking here. This dish will be cooked when ordered and served when ready. Caille - Quail. Quail on the Menu in France. Carré (carre) d'Agneau – A rack of lamb. Ordering Lamb in France II. Cuisine à la Périgourdine - Dining in the Four Colors of the Dordogne-Perigord. Escargots - Snails on French Menus and How to Order Snails in France. If You Enjoy Cockels, Mussels and Conches, Then Snails will not be Strange. Lapin - Rabbit on French Menus. Mushrooms in France I, The Champignon de Paris, the Button Mushroom. 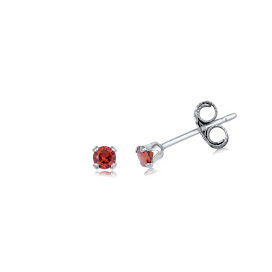 Noix – The Walnut. France’s Beloved Nut. The Walnut on French Menus. Ordering mussels in France. 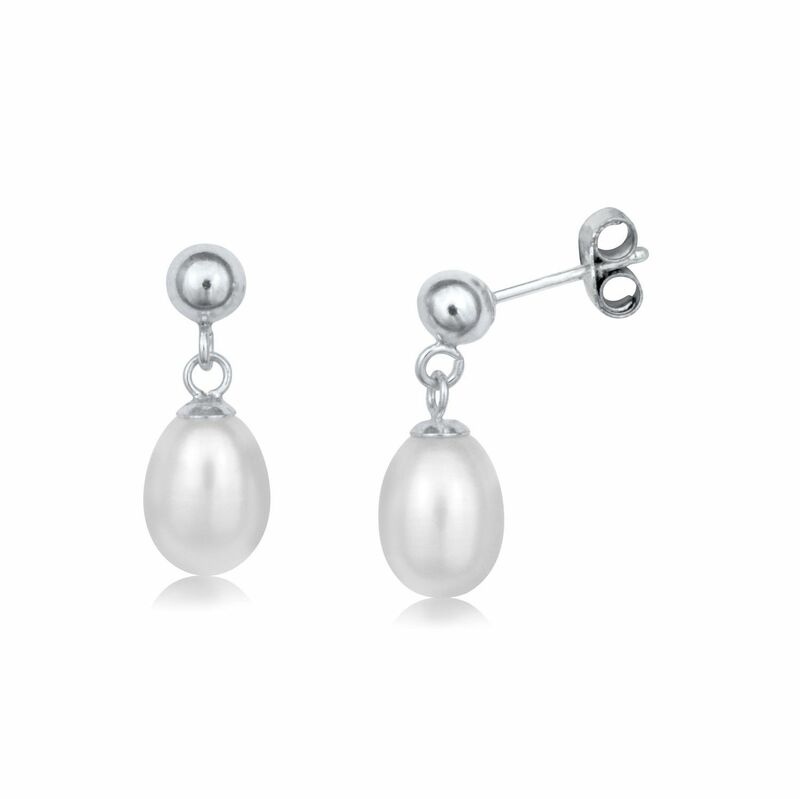 More than just Moules Frites, and How to Order Moules Frites. Salad Perigourdine (Salade Périgourdine) on the French Menu. Sanglier - Wild Boar on French Menus? Searching for truffles in France, and truffles on French Menus. The Black Perigord Truffle and Truffles Oils and Truffles Essences. Sète (Sete) and its Cuisine. Sète is the Largest Fishing Port on France’s Mediterranean Coast. What is a Confit? All About That Confit on Your French Menu. 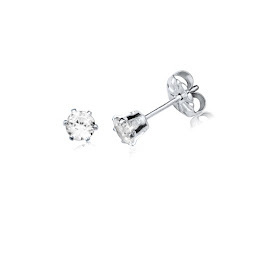 What a fantastic, complete post. Unfortunately, I have just never been a cassoulet fan...maybe I just haven't eaten the right ones! From your comment I believe that you have been to one or two of the same restaurants that I have also mistakenly entered! For my once or twice a year cassoulet fix I only go to restaurants where it very clear that most of the diners are locals. Unfortunately there are restaurants that see a great many tourists and decide that they can get away with cheaper ingredients. In winter a well-made cassoulet is a deeply satisfying dish.